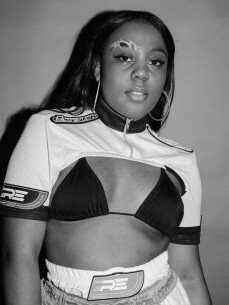 She’s become a familiar face during radical and underground club nights as a DJ and has been seen doing shows with Mykki Blanco and on line-ups alongside names like Fatima Al Qadiri, Evian Christ, Le1f, Yves Tumor and SOPHIE. Ever since deciding to take making music seriously somewhere in 2016 and teaching herself to use Logic with online tutorials, LYZZA has been building a name for herself on the alternative club scene. On the one hand, this is down to her music. LYZZA’s sound stands apart, erring more towards whole compositions than tracks built specifically for the club. On the other, it’s because of a reputation she’s growing as someone who speaks their mind and is here to change things by showing people that there are ways to do things outside of the status quo if you’re willing to try hard enough. Her talents recognised by platforms such as Dummy Magazine, Subbacultcha,THUMP and being named 'One of the Electronic Artists to watch in 2018' by Radar Radio ; we expect to only hear more from LYZZA in the upcoming years.